In part two of his look back at twenty years of the Barbel Society Steve Pope looks at publications and projects. Tony Gibson seems to be cursed when it comes to landing huge chub on the float, so just what happens when he hooks a possible PB on an Ouse session? Does it end in glory, or in tears? Catch up with Jack Perks and his superb underwater fish filming. Emma landed a great eel to kickstart her challenge, but what's next on the hit list? Tony's back behind his rods after an enforced break, boy is he back! Emma has a hooked a big eel, but it's heading for a snag, can she stop it in time? 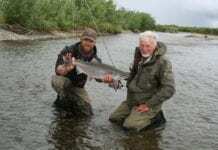 As much as he loves his foreign fishing adventures, Martin Salter is pleased to be back on his own rivers.